Former Saint Lee Gaskell has signed a four-year contract with Huddersfield. 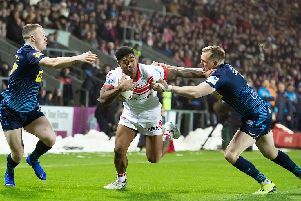 The 26-year-old stand-off made a total of 43 appearances for St Helens, including the 2011 Grand Final, before his move to the Bulls, where he was named 2015 Championship Player of the Year. “To be back in Super League is a great feeling,” said Gaskell, who endured an injury-hit season in 2016. “This is something I’m looking forward to. The set-up here is really good and all the coaching, conditioning and medical staff have been really good in getting me back to full fitness. I’ve had a short time here so far and it’s good to get that training under my belt. Huddersfield managing director Richard Thewlis said: “At his time of signing Lee Gaskell was probably the most sought-after UK-based player in the game. We were all delighted when he chose to join the Giants ahead of a number of our rival Super League clubs who were also keen on securing his services. “Like Cloughy, he has genuine big-match experience and an absolute desire to get himself and his new team-mates into the games and finals that he was brought up on when establishing himself as a starting player at St Helens. “He was a stand-out performer for the Bulls and I’m sure it was disappointing for everyone that his time there didn’t finish as either party would have liked.